BLACKBERRY MESSENGER RECRUITMENT CONTEST NIGERIA. 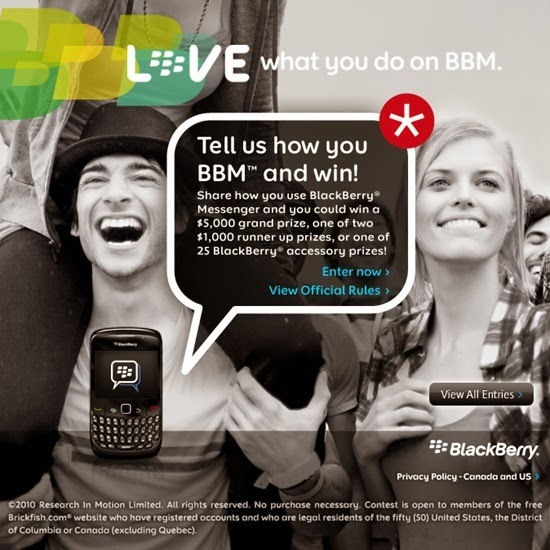 BBM is awarding 1,000 prizes of NGN 10,000 each in prepaid airtime credit to those who recruit the most new BBM users. Begin recruiting new BBM users right away! Make sure you add them to your BBM contact list so we can count them. Each new recruit must be new to BBM, have a minimum of 10 contacts by the end of the contest and send messages regularly. The 1,000 people who recruit the most new BBM users will receive NGN 10,000 prepaid airtime value deposited to their prepaid airtime account. Contest runs between January 30th and April 30th, 2015.